CAMBRIDGE – It turns out again that pure Bedlam is a lot of fun. Bedlam is the award-winning theatrical troupe known for staging high-flying adaptations of classic works, usually performed by a minimal cast playing several characters. Director Eric Tucker, who also presided over the staging, has reconfigured the Loeb for this production with a long rectangular playing space flanked by the audience on either side. At one end is a “safe room” where props, set pieces and – from time to time – actors can be rolled out on casters to join the fray. While the cast of 10 often double or triple up in their roles, they are all part of the chattering class that frequently confide in each other – and in audience members – about what is really going on behind the scenes. 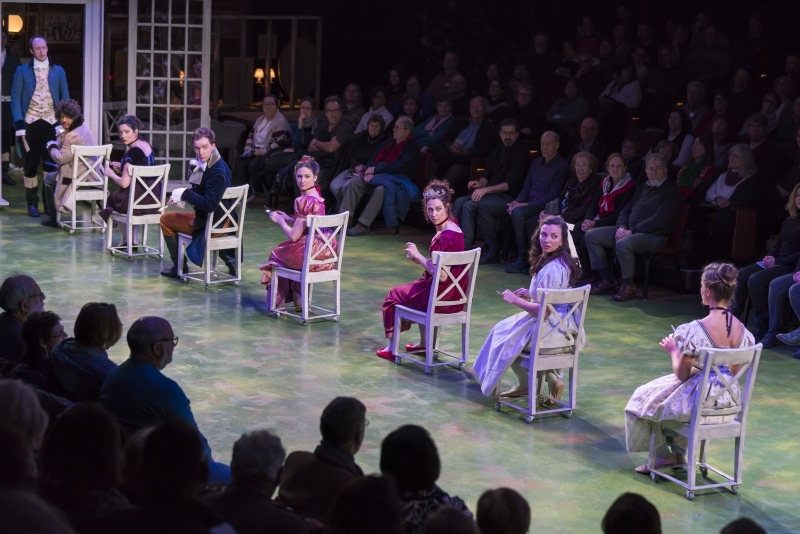 Playwright Kate Hamill’s adaptation of the Jane Austen classic moves as quickly as a character can travel on a chair outfitted with casters, being pushed across the stage. It hues closely to the plot line, but in some ways Tucker and Hamill have decided this story also has relevance for the times at hand. Hamill begins her adaptation with the cast in modern garb, and after some frantic dancing in modern style, they begin to doff some clothing until they are outfitted in period dress, doing a period dance. Bedlam breaks down – makes that knocks down — that imaginary fourth wall early on. The audience is in and amongst the players at a dinner party as the actors gossip with theater-goers on one side of the theater before suddenly rolling over to the other side of the theater. In late 18th century England, life can be cruel if you are suddenly cut off from home, hearth and fortune, as happens to the Dashwood sisters – the reserved Elinor (Maggie Adams McDowell), the less-reserved Marianne (Jessica Frey), and young Margaret (Violeta Picayo). They find themselves homeless and penniless after the death of their father, who left his entire estate to his son by his first marriage, John Dashwood (Benjamin Russell). He decides to cast his sisters adrift. The find modest lodging through the graciousness of a friend, but to cement their future they must become 18th Century gold-diggers, fortune hunters, single sisters jockeying for position when it comes to eligible bachelors with fortunes – or even ones with impending fortunes or inheritances. Russell returns as the dashing but damaged John Willoughby, who eventually leaves chaos in his wake after first rescuing Marianne, who falls deeply in love with him. That is bad news for the backup plan, long-in-the-tooth, decent but unexciting bachelor Colonel Brandon (James Patrick Nelson), shunted aside by Marianne until events prove him the wiser choice. Jamie Smithson does double duty, first as the rudderless Edward Ferrars, condemned to live a life of leisure and absolutely no substance, once engaged to Lucy Steele but now bewitched by Elinor Dashwood; he will return as his besotted brother Robert. Nigel Gore has a wickedly fun time – and the audience does, too — in his gender-crossing role as Mrs. Jennings, a professional gossip and speculator about ongoing romances, even though she is no longer in the game. She dispenses advice, often vulgar, about the best way to proceed in catching a man. You might think with all this going on, the storyline would be demolished or lost, but that’s hardly the case. Bedlam is deadly serious about performing quality theater, and equally serious about having fun at the same time. Those two qualities – and the talents of the cast, director Tucker and playwright Hamill – have breathed new theatrical life into classic pieces of literature, made them more accessible, and brought in new audiences to be delighted by them. So if you like your Austen bright and breezy, with a generous dollop of humor, this “Sense & Sensibility” makes perfect sense. 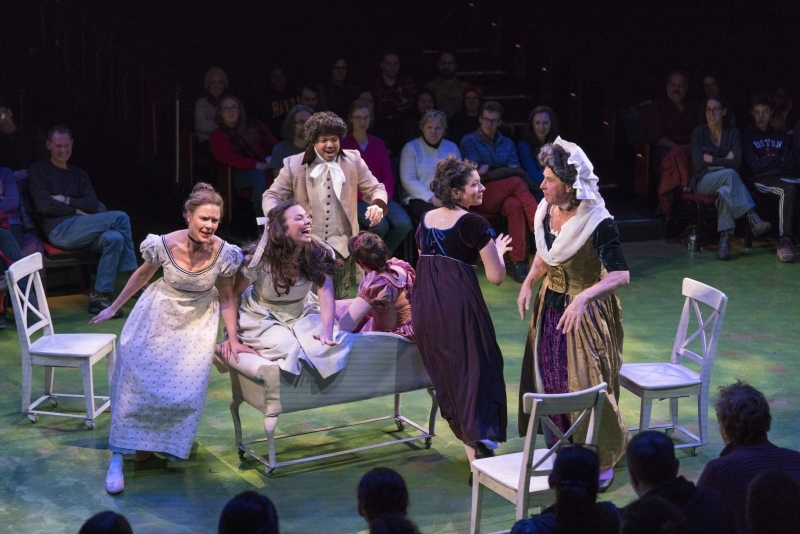 American Repertory Theater presents Bedlam’s “Sense & Sensibility.” Written by Kate Hamill, based on the novel by Jane Austen. Staging and direction by Eric Tucker. Choreography by Alexandra Beller. At the Loeb Drama Center through Jan. 14. AmericanRepertoryTheater.org.